I decided to start working a bit on my Chaos stuff again for a while. 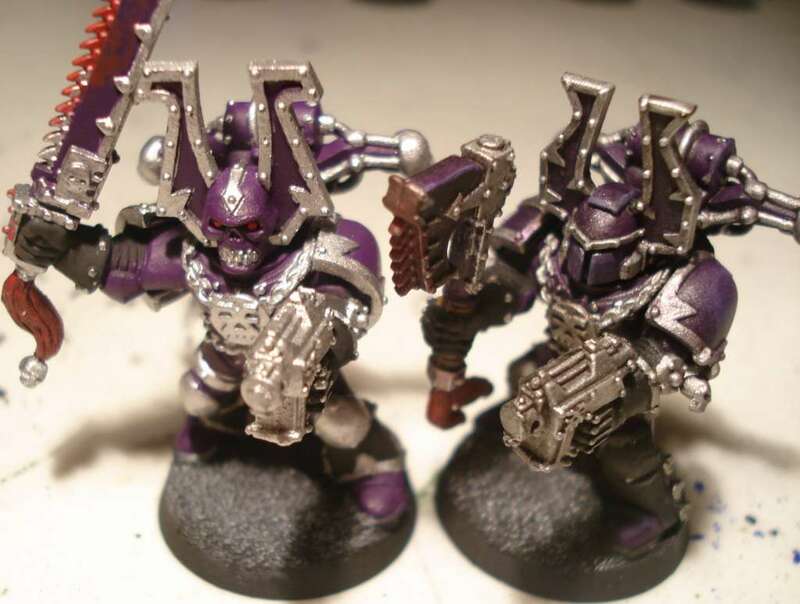 I managed to get the silver detailing done on two Berzerkers tonight while watching Gran Tourino (great movie). There is just so much detailing, and I take a ton of time being precise, so it takes me a long time to get anything done on these guys. 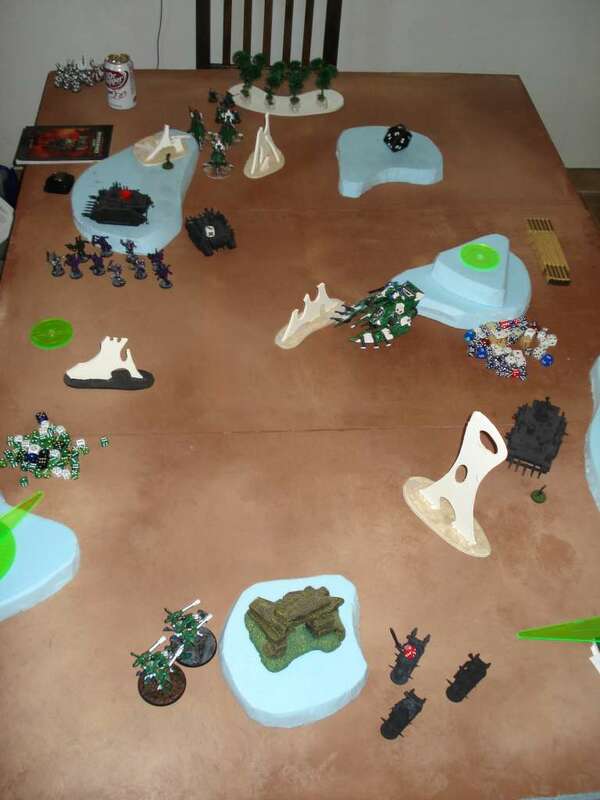 The second game Nick and I played on Sunday was my Chaos versus his Eldar. he had made a few tweaks to his list and I think it was a stronger list, but he made some critical mistakes that ultimately hurt him. The game was using the modified Capture and Control scenario from the ‘Ard Boyz tournaments. Basically, spearhead deployment with one objective in the center of the table quarters that weren’t deployment zones. I lost the roll and was forced to go first. I deployed two Rhinos with the CSM and Zerkers as far towards the center with the bikers, and the other Rhino with the Noise Marines behind a hill heading to my left. Nick deployed in the back of his zone with the Serpent and Wraithlord in the far center, and the Walkers to my left behind some ruins. The Pathfinders infiltrated onto the objective on his side of the board and the Vypers were held in reserves. The first two turns weren’t very eventful. My bikes sped forward into the center. The Rhinos with CSM and Zerkers headed towards the objective on his side, and the Noise Marines moved towards the objective on my side. On Nick’s turn, the Walkers managed to kill one biker and wound the Lord, but that was it. On the second turn, my bikes managed to kill a walker and shake the other two, while Nick’s Vypers came on but didn’t do much. Turn three got a bit more interesting. My bikes continued towards the Walkers and managed shake them again. While my Rhinos all pulled up closer to their objectives. 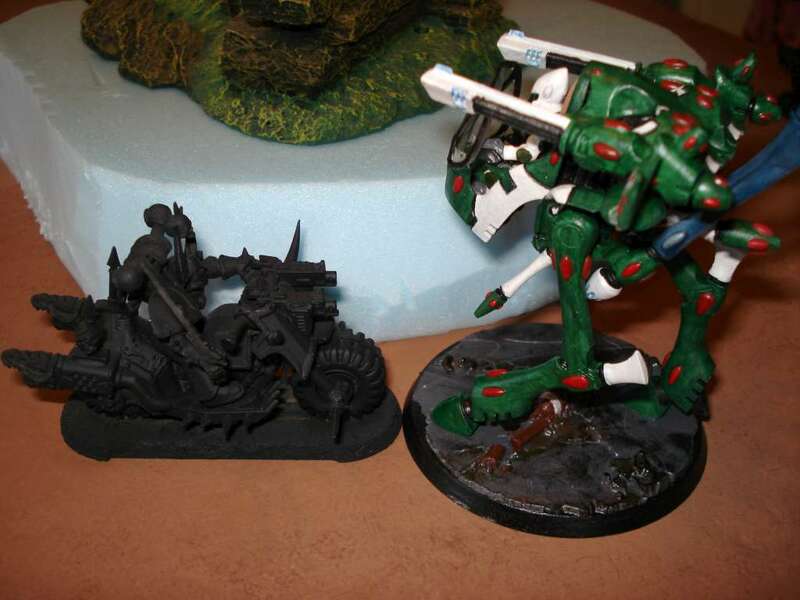 For Nick, the Vypers managed to destroy the Zerkers’ Rhino, and the Pathfinders ran out of the line of fire. The Serpent moved into the center of the board keeping a cover save. On turn four, things got really ugly for Nick. 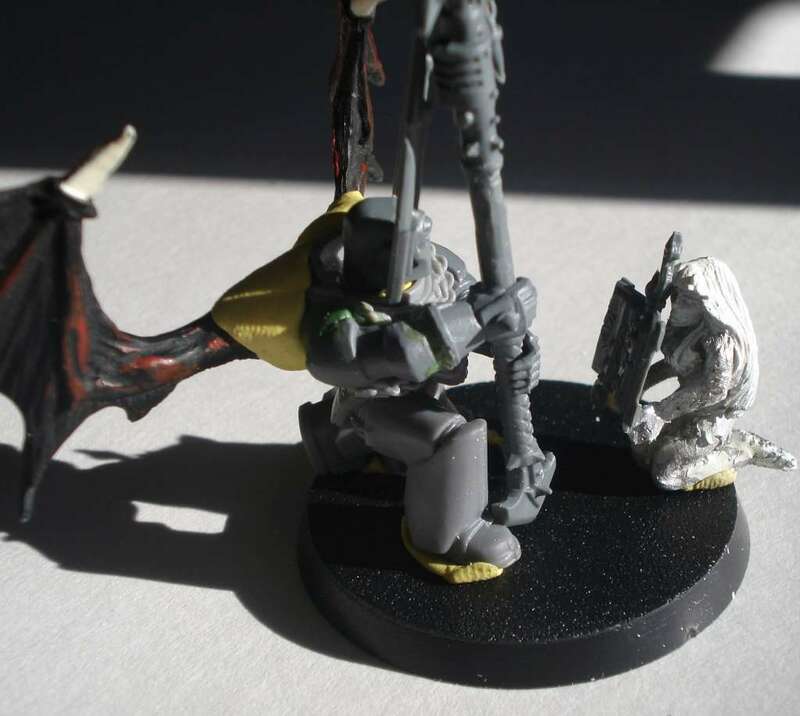 The now transport-less Berzerkers charged the Wraithlord and managed to take it down with the Power Fist. The Bikers kept chasing and shooting the Walkers, this time immobilizing one, which wrecked it. 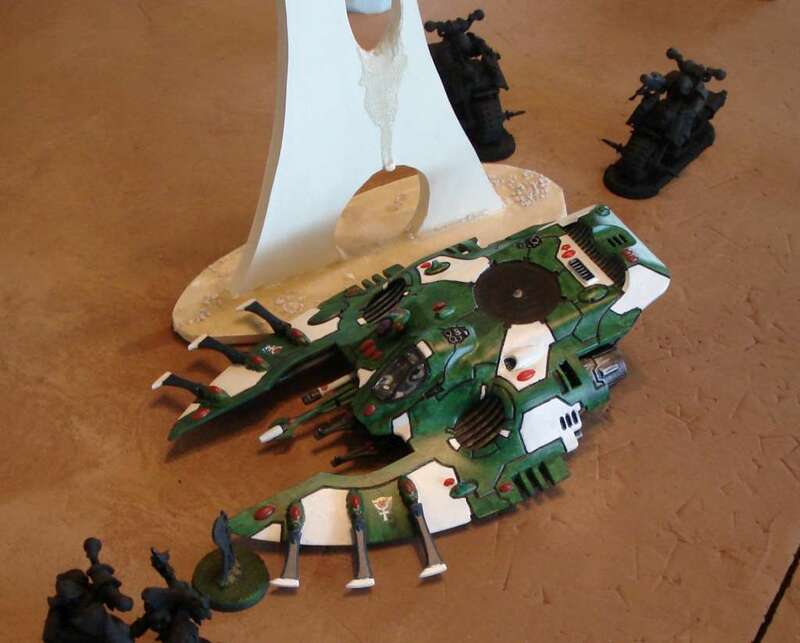 The Chaos Marines tried to shoot the Wave Serpent from their Rhino but failed. Nick’s Vypers tried to take out the Marines’ Rhino, but couldn’t and the Guardians made their way towards the other objective. The rest of the game was kind of a blur. The Lord managed to get in combat with the Walker and took a few turns, but finally killed it. 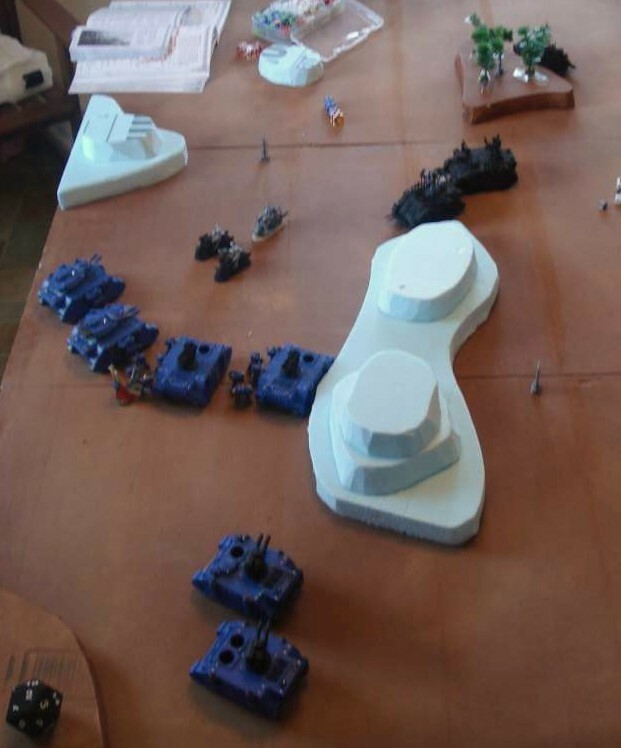 The CSM and Berzerkers surrounded the point on the far side, and even though the Vypers tried to contest, they were eventually taken down in assault. 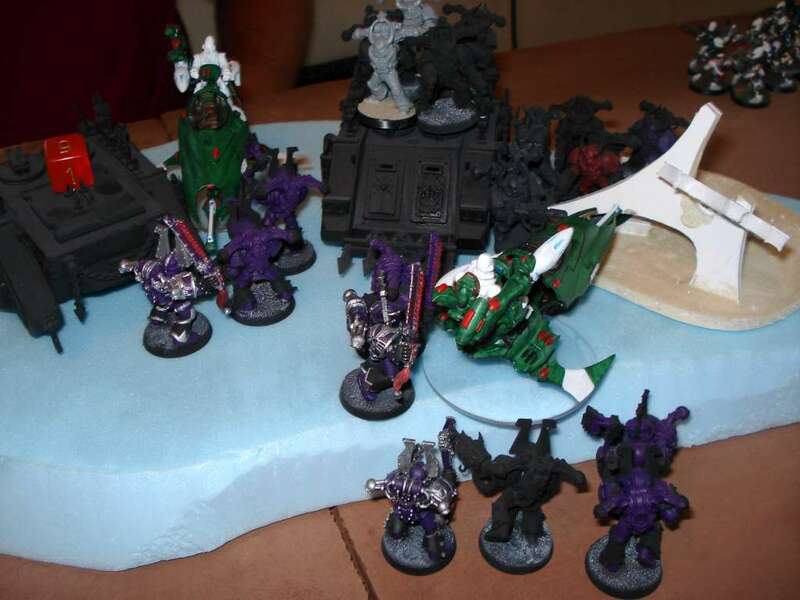 The Storm Guardians tried to kill the Noise Marines in assault, but since they had also destroyed the Marines’ Rhino, they had to assault through difficult terrain, leaving them at a huge disadvantage. In the end I was able to hold both points, while Nick held none. The biggest factor was in deployment. Nick should not have left his Walkers alone on a flank, and the Vypers should not have been put in reserves. I had no reliable, long range anti-tank weapons, so they should have been on the field shooting my Rhino’s on turn one. Also, I would have left the bikers alone on the first turn, because even through they were my fastest unit, the units in the Rhinos were much more dangerous. Overall it was a good game, and it was nice to play something different again. I didn’t do much painting over the weekend. Spent part of the time doing some home repairs, and the rest playing Fable 2. I did get a little done, though, and some more done tonight. First up are the mission counters that I’ve been meaning to make for a while. Since 5th Edition needs anywhere from 0-5 counters depending on the mission, I figured I’d make up some quick Eldar themed markers for fun. 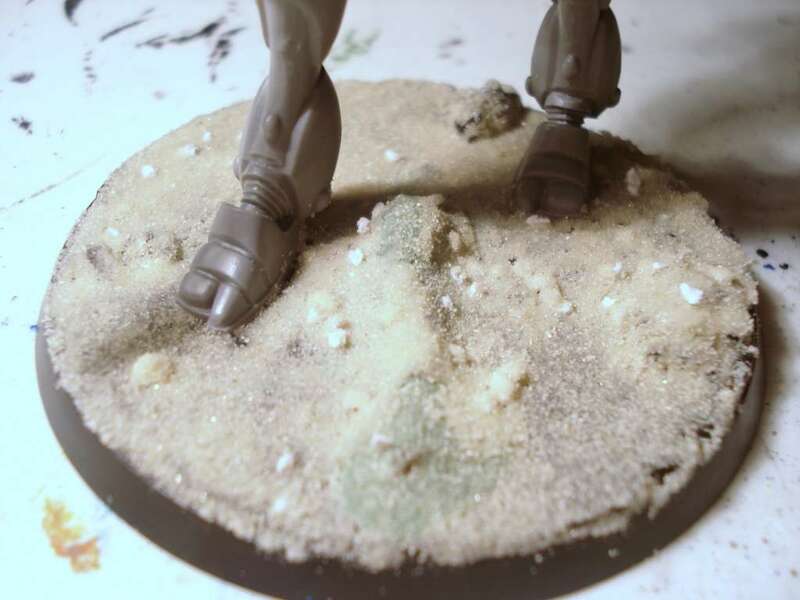 These were made from various spare bits from the Dire Avenger, War Walker and Wraithlord sets and based on normal infantry bases with some sand that will be painted to match my other bases. 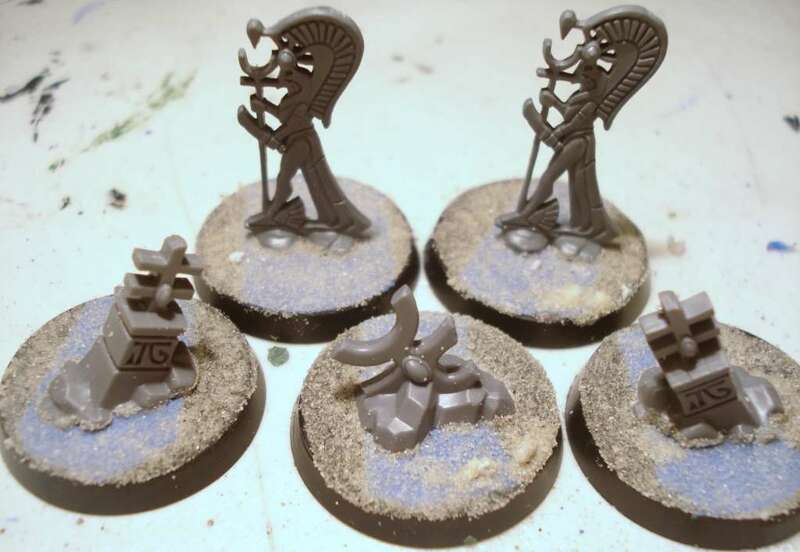 Next up are the bases for my Wraithlords. 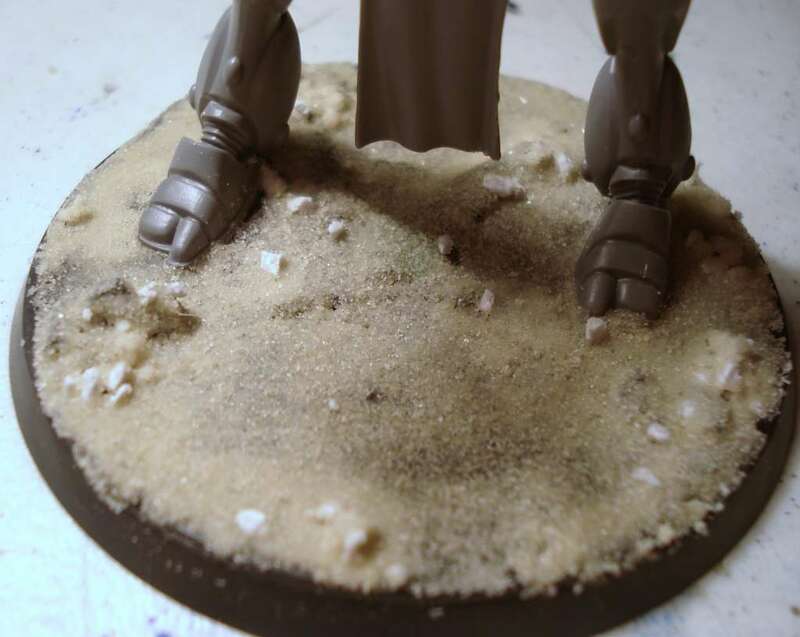 They were done with the fancy bases that come with the Walkers and Wraithlords, and then covered with sand and larger gravel. I love those bases, but they get a little generic if you have 8 of them. So most of mine are covered so they look more unique. One of these has the missile cut down so there isn’t as much of a lump in the middle of the base. Last but not least, some more Berzerkers. The one on the left I finished up the silver and red detailing tonight, and now just needs some touch-ups, highlights and a dark wash to give it some depth. The one on the right was completed over the weekend. Connected the wings and shoulders. I also added a little bling to the right arm. The other major work was adding a loincloth in the front and back. I don’t think it turned out too badly, though I did make a few tweaks after taking these pictures to make some of the curves more defined. And I plan on tattering up the edges once the putty dries. I glued and greenstuffed the body together last night and it looks great so far. Now I’m doing some tests on the base and the rest of the details. I was originally planning on giving him a cloak, but now I think I’m going to do wings. 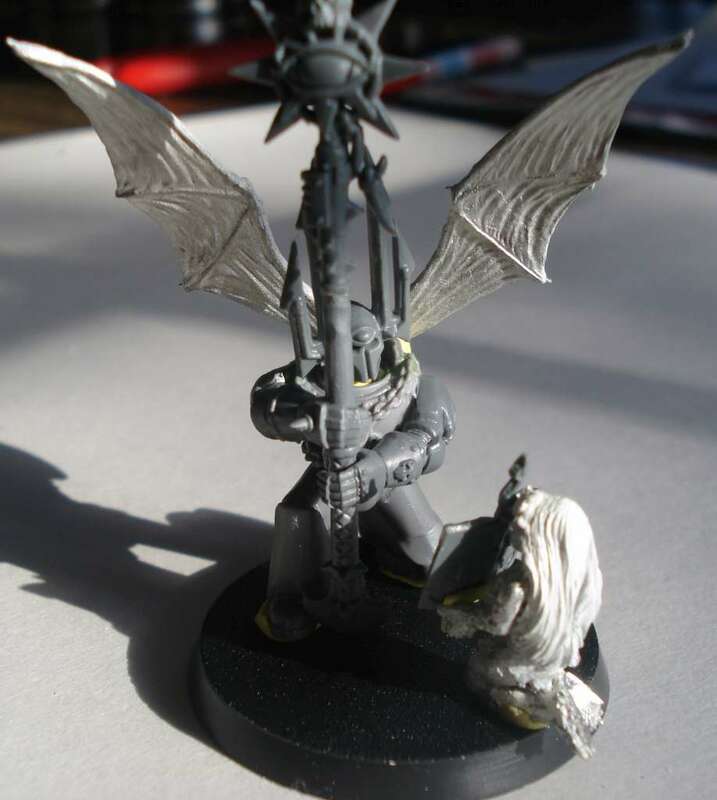 I have two sets of leathery bat/daemon wings that could work. I’m kind of leaning towards the large ones. Though some large feathery raven wings might be neat too. I’ve also added a female “slave” that is holding a book open for the sorcerer to read his dark magics from. She’s a fairly old mini that I’ve wanted to work into a conversion for a while. She needs to be cleaned up quite a bit, but I think it will look great. There’s still plenty to do, but overall I think it is coming along well. 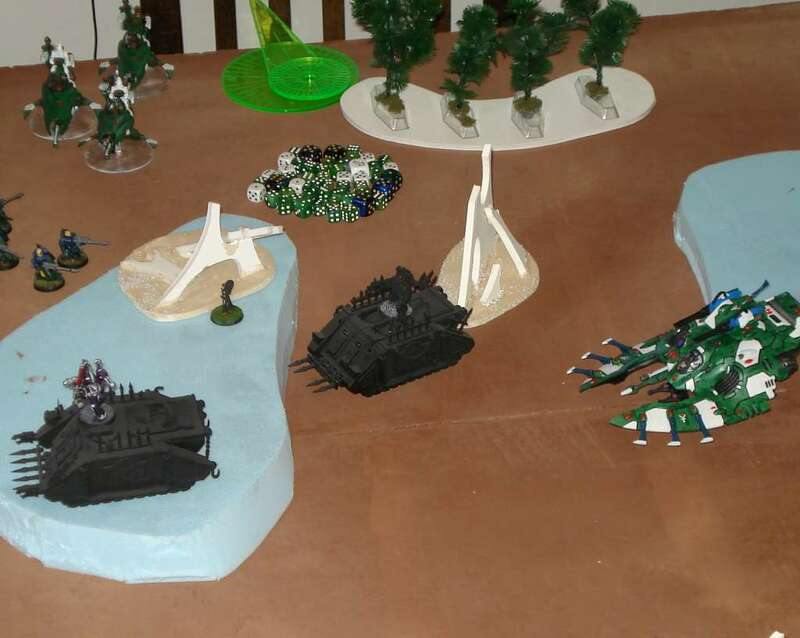 Seeing as how the tournament that was originally planned for the weekend was postponed due to flooding in the area, my friend Ryan and I decided to play a 1000 point game so I could try out my new Chaos army. 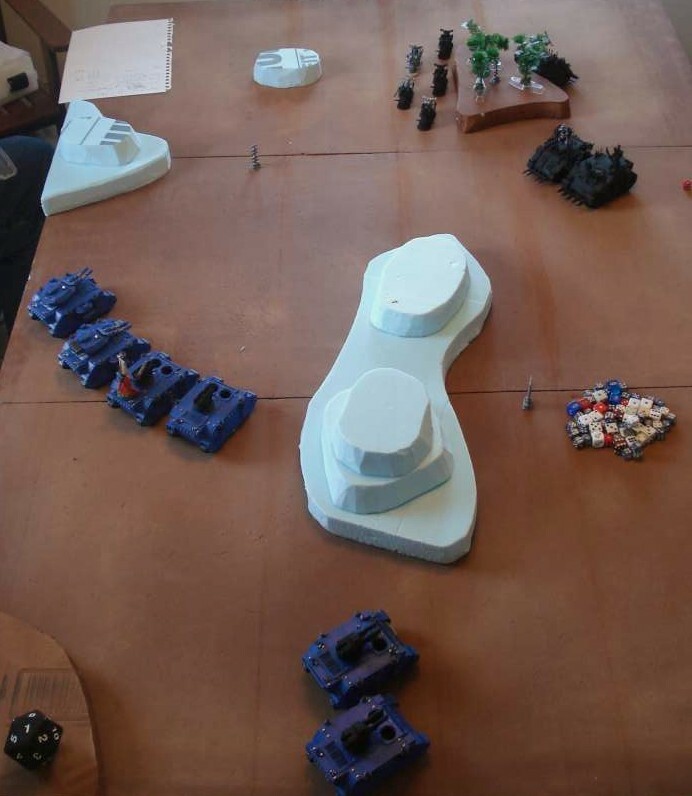 We rolled for game type and deployment, and we ended up with Seize Ground with Table Quarters. There was a total of 3 objectives. One was place in the trees on the hill, another was place nearby in the open, and the last was behind the large hill. I won the roll off, and decided to go first. The Rhinos with the Noise Marines and Zerkers were at the front edge of my deployment zone, along with the bikers. 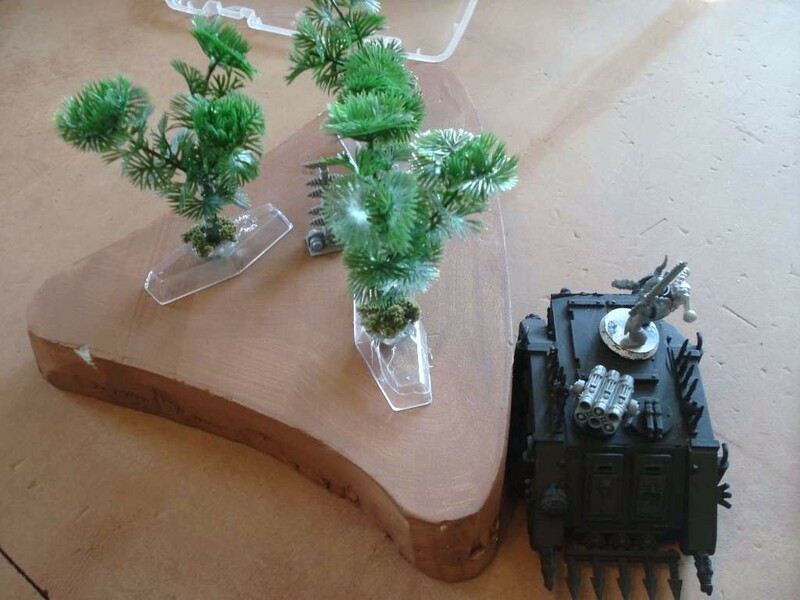 The Havok Launcher Rhino was held back behind the trees to fire the occasional shot and protect the objective. Ryan deployed the Predators and Heavy Bolter Razorbacks in a line facing my Rhinos. His Lascannon Razorbacks were deployed covering the back side of the large hill. Ryan tried to steal the initiative, but luckily for me he failed. The first turn wasn’t too eventful for me. My bikes roared toward his line and the Rhinos moved up with the Berzerker’s Rhino in front popping smoke to obscure the shots on them. Ryan moved up, disembarked the marines, and fired everything into the oncoming bikers. The bikers survived the volley, only losing the two leaving the meltagunners and Lord alive. On turn two, the Lord split from the bikers and headed toward the marine squad without the Chapter Master. The remaining bikers moved up and fired on the first Predator and turned it into a pile of scrap. 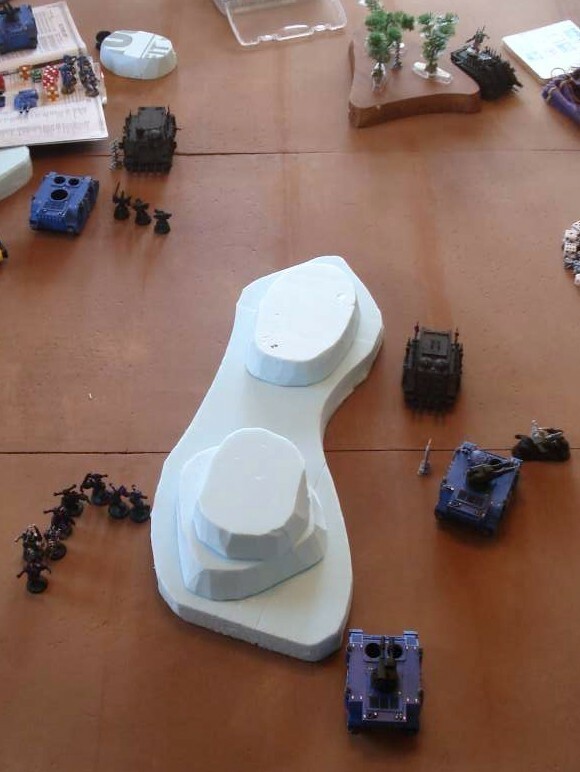 The Rhinos continued their advance, this time with the Noise Marines popping smoke. The other Rhino fired its havok launcher at one of the marine squads killing one marine. 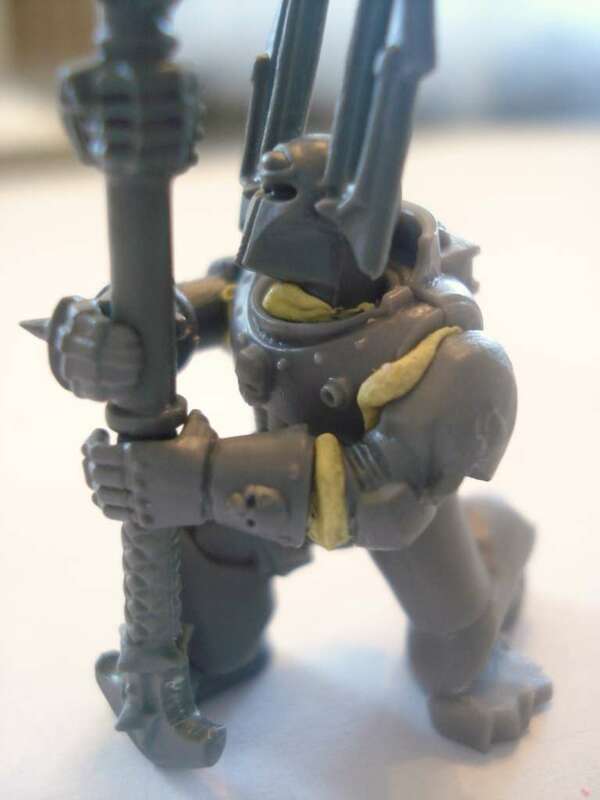 In assault, the Lord attacked the marines, but his daemon weapon rebelled and he ended up taking a wound. The marines couldn’t touch him, so they would go on fighting. The Ultramarine tanks backed away from the assault and fired on the Chaos Rhinos, but only managed to shake or stun them. The other marine squad joined the assault, and the real fun began. The Lord managed to regain control of his weapon, and killed a few marines. 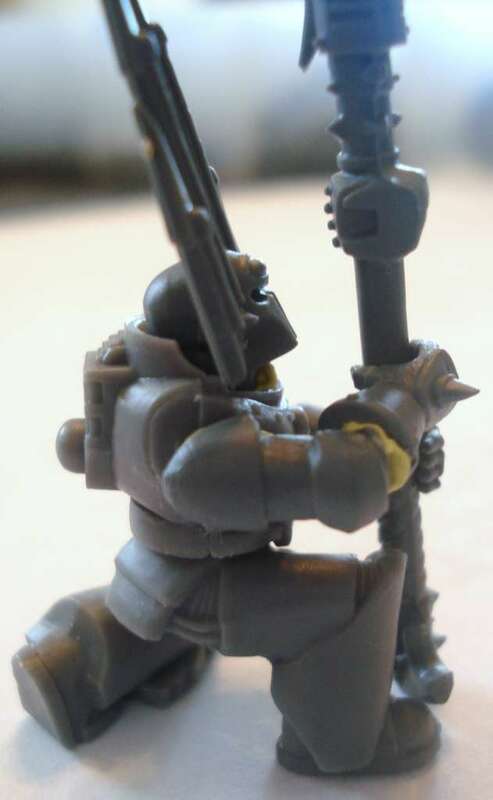 The Chapter Master’s sword swung true and managed to injure the Lord. None of the marines ran, though, and the fight would continue. The Zerkers and Noise marines jumped out of their transports and charged into battle. 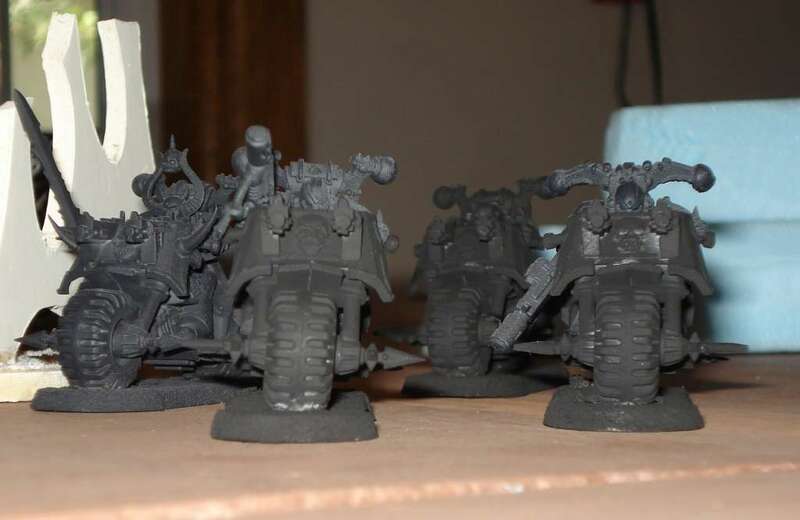 In shooting, the havok launcher managed to take out the heavy bolter on one of the Razorbacks, and the bikers melted the other Predator. In assault, the Berzerkers changed the Razorback that was still armed, but only succeeded in stunning and shaking it. 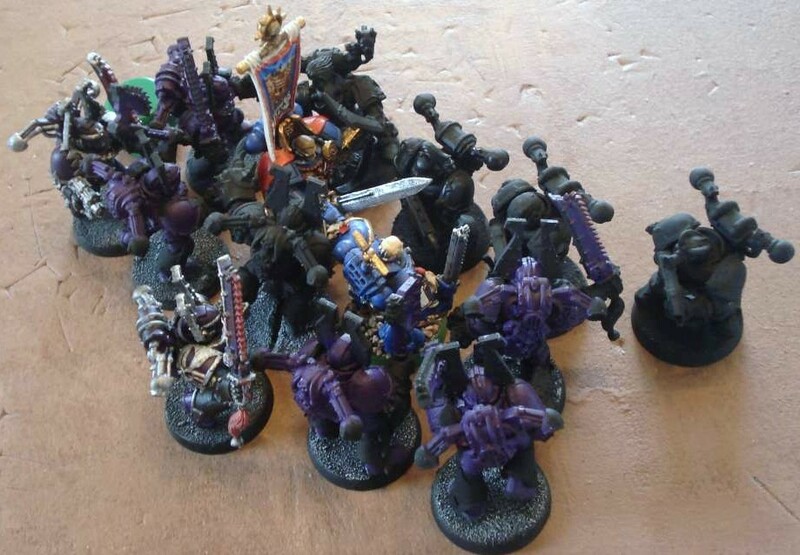 The Noise Marines piled into the ongoing assault and while the Noise Champion and Lord failed to injure the Chapter Master, the other Noise Marines succeeding in taking out a couple marines. 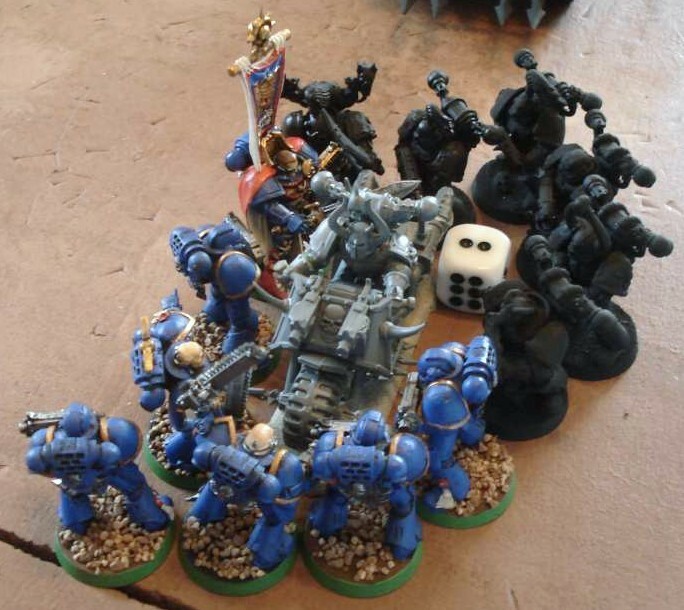 The battle raged on, and on Ryan’s turn, the Chaos Lord and two of the Noise Marines perished to the Ultramarines, but not before wounding the Chapter Master. The Zerkers immobilized the Razorback, but it was still capable of shooting. The Ultramarine’s lascannons killed off one of the remaining bikers and caused the last one to run for the border. As turn four rolled around, Zerkers pulled off of the tanks and plowed into the melee. 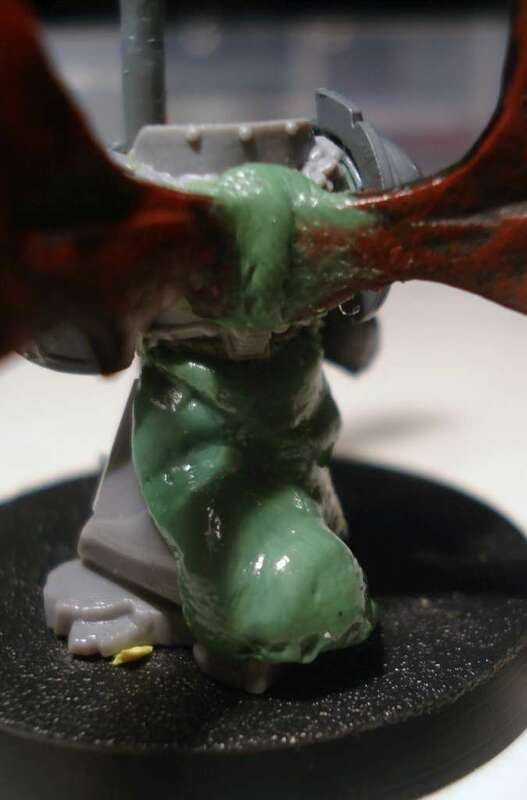 The Chapter Master took another wound on the Chaos turn and the three Marines from his squad were eliminated. The bravely foolish marines decided to continue the fight, though. 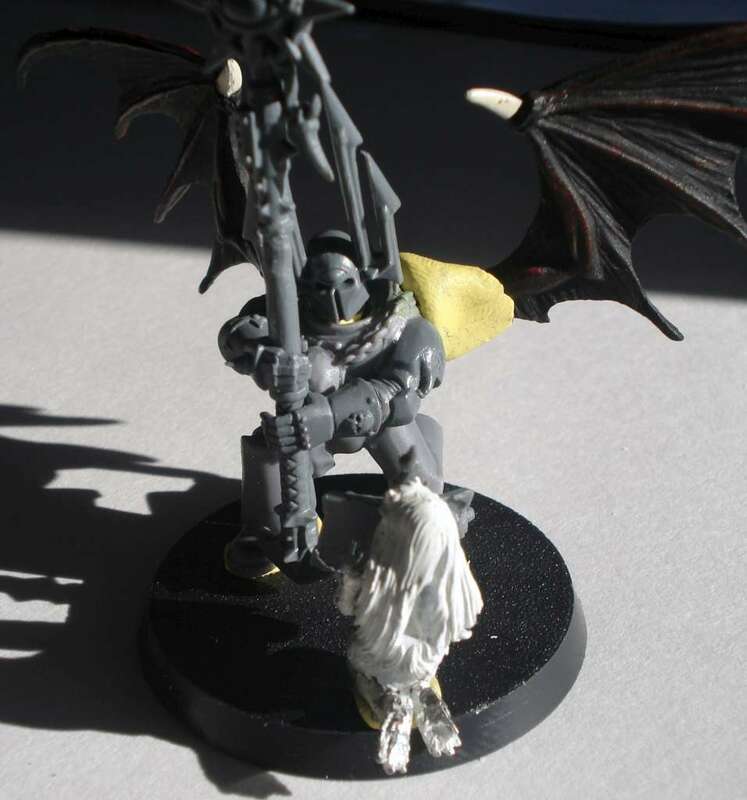 The Chapter Master and Sergeant would finally perish on Ryan’s turn. 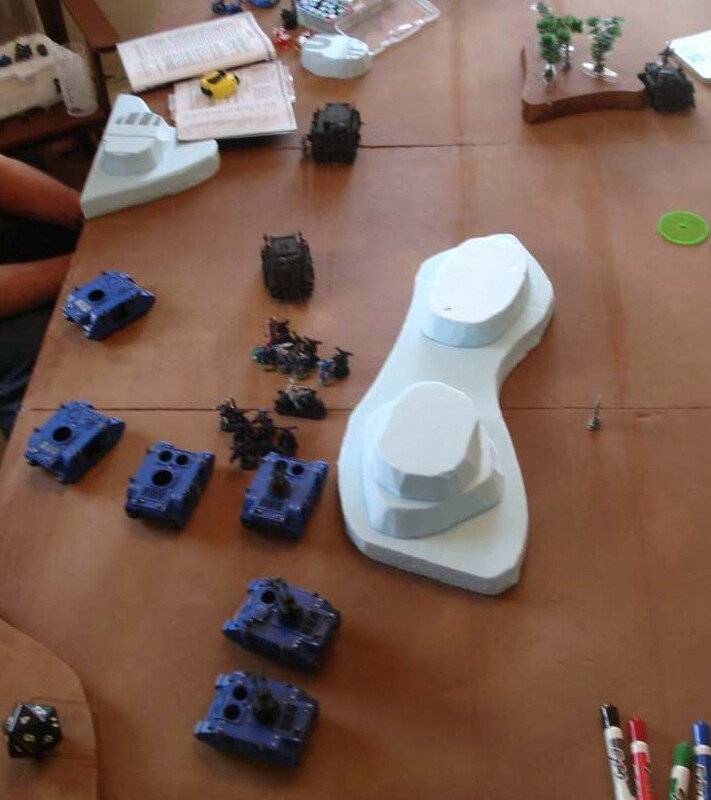 At this point the Lascannon Razorbacks were moving towards the objective behind the hill, while one of the Chaos Rhinos was moved to try and contest. Turn five would end up being the last turn. 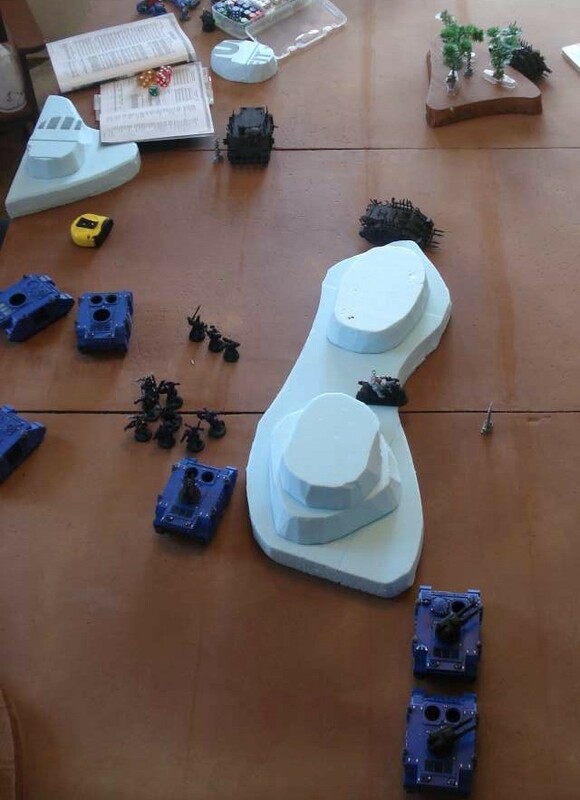 This was detrimental to me, because I realized as I passed the turn, that while I had managed to move two of my Rhinos into position to contest two objectives, I had forgotten to disembark my Chaos Marines and move them into a controlling position on the objective they had been guarding all game. 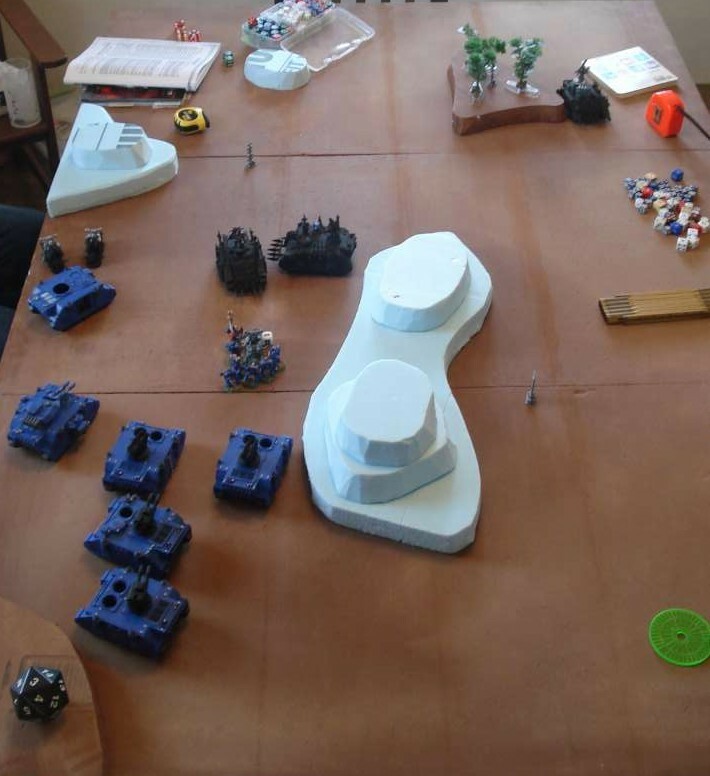 Ryan’s Razorbacks were able to get close enough to the objective to control, but he managed to roll a 1 for penetrating the Rhino with the Lascannon, so it survived to contest. He rolled to see if the game would end, and it did. The final score was both sides contolling 0 objectives for a draw. This was the scene at my objective that I should have controlled. Overall it was a fun game, and it was nice to try something different. Ryan had some terrible luck, and I think it would have been a lot different if he hadn’t rolled 1’s to penetrate the Rhinos at least twice. 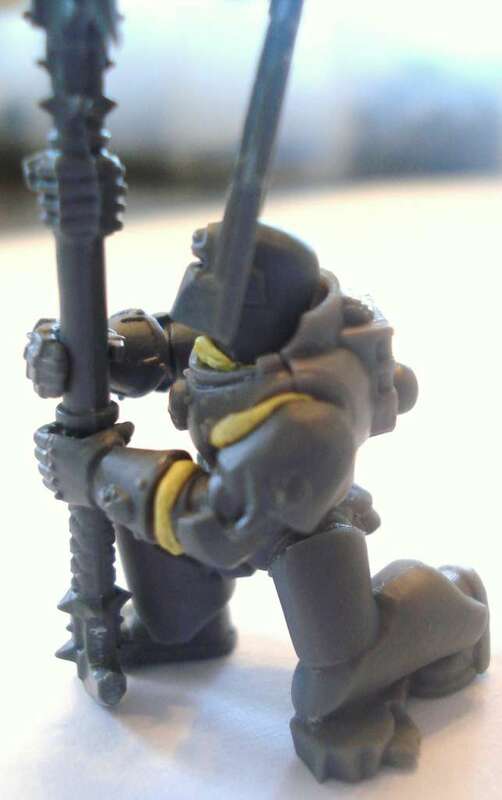 I was going through some of my bitz today looking for parts to finish off a few of my Chaos Space Marines, and I came across a pair of legs from a Space Marine command squad. The legs were posed so that one leg was in a kneeling position. 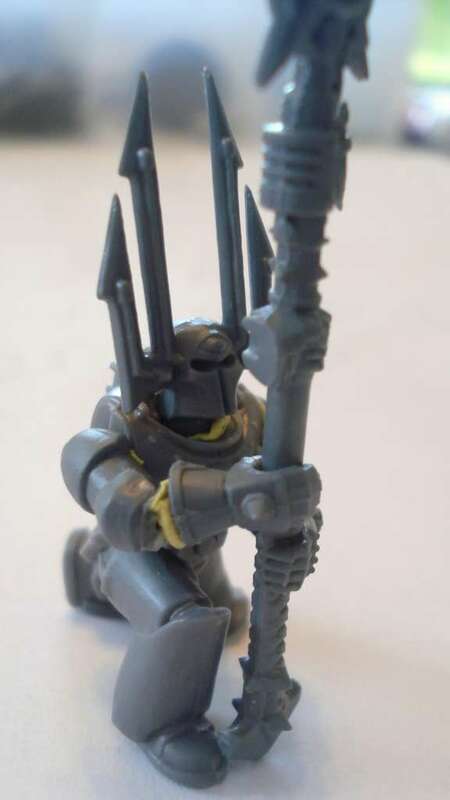 This gave me an idea for something to do with the leftover bits from my plastic Chaos Terminator Lord set, which is one of the best sets for great conversions. 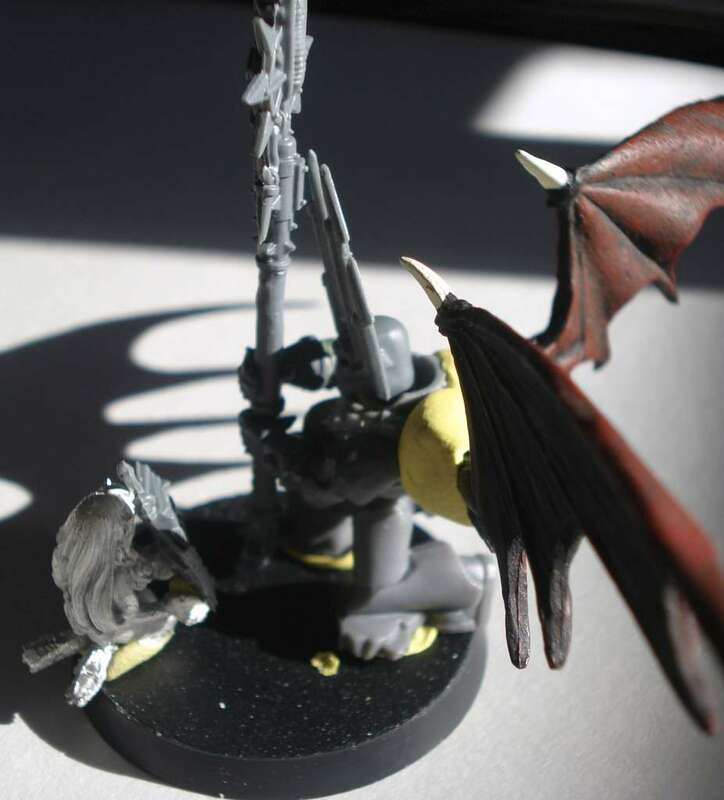 So here is the initial trial for my kneeling Chaos Sorcerer. It’s just held together with sticky putty so in order to try and get the pose the way I want it. The intent is for him to look like he is calling upon the power of his dark god. 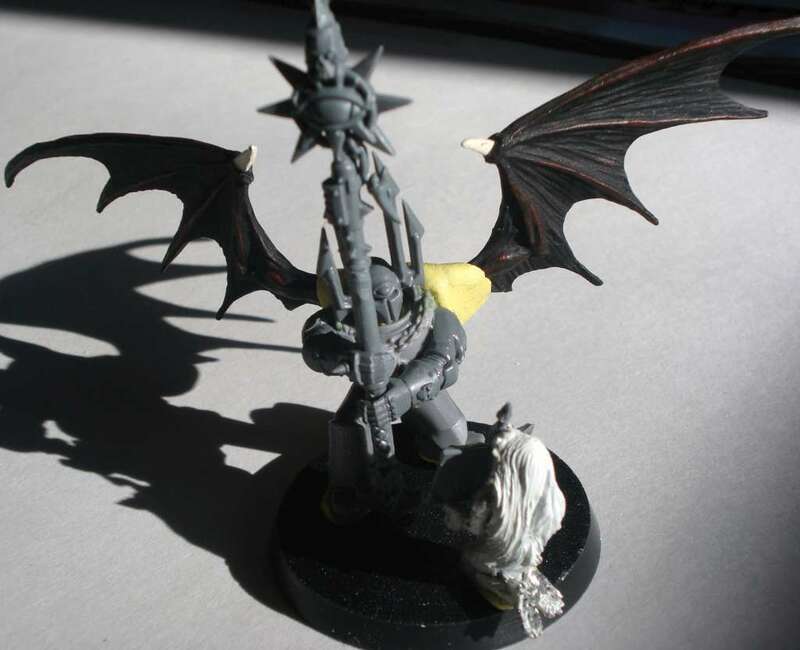 Of course details like spiky Chaos bits will be added, and I intend to give him a cloak made of green stuff, but this is simply a test of the whether the concept will even work.